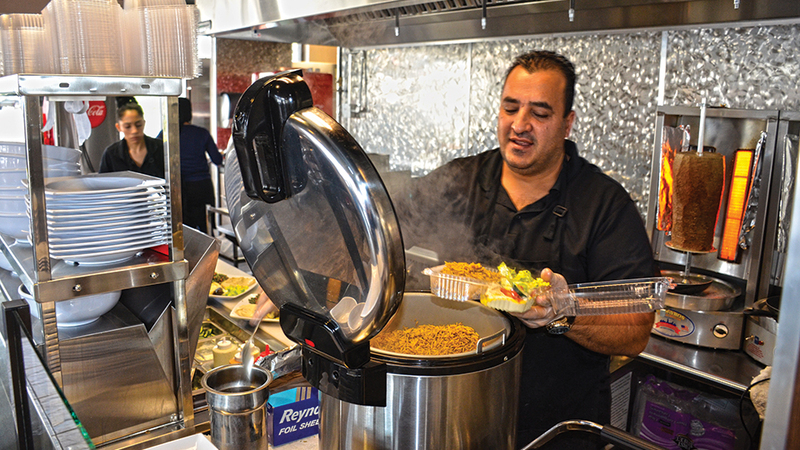 Nezam Hammad packs up a to-go order at Gyro Stop at 3860 River Road N.
When he was still a pre-teen, Nezam Hammad began working alongside his father in the family’s Mediterranean restaurant. He’s now teaching one of his daughters to manage one of Keizer’s newest restaurants, Gyro Stop. Nila is Nila Kamis, Hammad and Tanya Kalugin’s daughter, who is in training to take over the shop. Hammad and Kalugin previously owned four Portland-area restaurants that they finished selling off in December to open Gyro Stop in Keizer. Gyro Stop is located in the former Birdie’s Bistro location at 3860 River Road N.
“I’m just kind of getting back into it and relearning everything, but I know this business and I want to be able to give (Hammad and Kalugin) a break,” Kamis said. A break is feeling more and more welcome as Gyro Stop’s reception has been overwhelming. “Everyone is really happy we came to the neighborhood and they’ve really come out and supported us,” said Kalugin. When Keizertimes first stopped in to talk with the owners on a Monday afternoon, the restaurant was so busy and packed that we postponed the talk for later in the week. When we returned on a brief respite three days later, Hammad and Kalugin were looking through a local home guide for available properties in Keizer. “We like this community and we’re going to try to buy a house here,” Hammad said. Kalugin had been pressuring Hammad to look into expansion in the Salem area. “I knew they didn’t have much of anything here and I told him we needed to expand to the Salem area,” said Kalugin. It was Kamis’s desire for a restaurant to call her own that finally moved the needle. Kamis championed a Keizer locale over Salem. When Kamis was ready, the transition began quickly. Gyro Stop offers a lengthy list of Mediterranean fare from gyros to falafel and dinner plates to mezza-style sampling platters with tastes drawn from the other sections of the menu. “Our focus is healthy and homemade. We make our bread dough every day several times a day,” Kalugin said. Gyro meat, a combination of lamb and beef, is cooked on a vertical spinner that allows all the fat to run out of it. Thick cuts make for a hearty meal at Gyro Stop. The business is in the process of applying for a license to serve beer and wine and Kalugin is hoping to bring in belly dancers from time to time. “It was a big hit on our opening day and customers have been asking when we’ll have them back,” Kalugin said. Gyro Stop is open Monday through Friday 11 a.m. to 8 p.m.; Saturday noon to 8 p.m.; and closed Sundays.